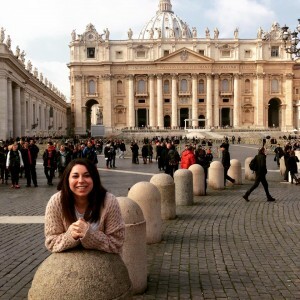 </a> While in Rome to visit an international school, I stopped by St. Peter's! As I'm sitting here in Porto San Giorgio writing this entry, I can't believe that it's already been one month into my adventure! There are still some days when I wake up and can't believe that I've actually been here in Italy, teaching little ones English and striving to become the best teacher that I can be. In the month that I've been here, I've become a Trenitalia pro! I've visited Milano, Roma, my mom's hometown of Fossalto (Molise) and am preparing to go to Verona! I've been trying to stay positive and tell myself that "I still have four weeks left!" as opposed to thinking that I unfortunately only have four weeks left. The trouble with being in a country like Italy for only two months is that it's not nearly enough time to even scratch the surface of what this country has to offer. I've made this place my home, and it's truly going to be a sad day when I have to go. In terms of school, things have been going well! I love my co-teachers, and I couldn't have asked for a better staff to work with. The children, though at times a bit difficult, have helped me expand my behavior-management techniques that I'll be able to take back to the States with me. I've also gotten experience working with autistic children, which I wasn't certified for in Ohio, and this experience has been so helpful to me as I really was timid about working with autistic children before. The experience that has been the best though, is that my co-teachers have enlisted my help tremendously in creating a curriculum for their school! For someone who has never had her own classroom yet as I just graduated in December, this has been exciting and a little bit stressful at the same time. However, I've learned to trust myself and recommend/make some awesome science, mathematics, literacy and practical life centers that the school can use to enhance its learning goals. In science right now, we've been working on the five senses and the kids have been having an absolute blast with the sensory activities that we've been doing. Lately, we've worked on making "salty dough" that they've been able to mold from the flour to the dough and then make shapes with them. Recently, as I previously mentioned, I took a trip to Rome with a teacher friend from university as we were scheduled to visit an international school there! She is a teacher in Kenya, Africa, for one year, and we've both been expanding our teaching through these experiences. While in Rome we had the opportunity to visit Kendale International School. The school is an old house that was transformed into a school that services students with ages three to 12 (preschool-fifth grade). Though all of the students are Italian, the teachers are all native speakers. The teachers came from Canada, England and America, so they were very excited to see other Americans there as well! The atmosphere of this school was so calming and welcoming, and the students were truly magnificent in their studies. The most exciting part of the trip was that they offered for me to keep in touch as they will have a position opening for the next school year!! Now, as someone who has always dreamed of living in Italy permanently, I'm sure you can imagine how I was on Cloud Nine. Though before it was only a dream, this trip made me feel as though I could seize this next opportunity and make more of my aspirations come true. This trip, even in a short month, has made me feel like a true Italian, and I never ever want to leave. I've always felt at home when I've been in Italy, and this trip has been a huge confirmation of that. I can't wait to write soon and tell all the details of my last few weeks! Until next time! Sofia is volunteering at a private elementary school as an English teacher with InterExchange Working Abroad thanks to the InterExchange Foundation and the Working Abroad Grant. 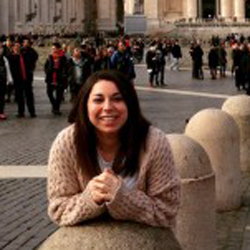 Sofia participated in InterExchange's School Teaching Assistant Italy program.